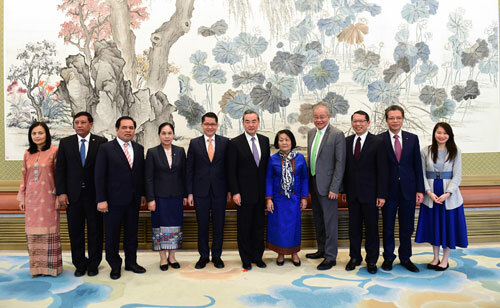 On October 23, 2018, State Councilor and Foreign Minister Wang Yi met with diplomatic envoys of the ten countries of the Association of Southeast Asian Nations (ASEAN) in China at the Diaoyutai State Guesthouse. Wang Yi expressed that China-ASEAN relations have stepped into a stage of maturity from a stage of growth. The two sides should take the 15th anniversary of the establishment of China-ASEAN strategic partnership as an opportunity to further enhance mutual trust and expand cooperation, so as to jointly promote China-ASEAN relations to a new stage. We are willing to continue to strengthen the integration of the Belt and Road Initiative with the ASEAN Community Vision 2025 and the ASEAN connectivity planning, and carry out more cooperation that conforms to the needs of both sides. Wang Yi pointed out that the Chinese side firmly supports the construction of the ASEAN community, supports the ASEAN's central position in regional cooperation, and supports the ASEAN in playing an active role in regional affairs. At present, the international situation is facing increasing instable and uncertain factors and rising unilateralism and protectionism, with international rules being challenged and multilateral system being impacted, which cause widespread concerns in the international community. China and the ASEAN countries are all developing countries, sharing extensive common interests. We are willing to, together with the ASEAN countries, commit to maintaining the rules-based multilateralism and free trade system, and safeguarding the important role of the United Nations in international affairs. China-ASEAN cooperation should continue playing a guiding role in East Asia cooperation, and cooperation of China, Japan and the Republic of Korea with the ASEAN should commit to advancing regional economic integration and the construction of the East Asia economic community. China and the ASEAN countries should jointly promote the series of East Asian leaders' meetings to continuously focus on the East Asia, facilitate cooperation, and play a positive role in maintaining regional peace and accelerating regional development. Wang Yi stressed that China agrees to carry out necessary reform to the World Trade Organization (WTO). We advocate that reform should be conducive to maintaining the basic principles of the WTO and safeguarding the legitimate rights and interests of the vast number of developing countries. The discussion on reform should be open and transparent, and listen to the broadest opinions to reach a consensus acceptable to all parties. Diplomatic envoys of the ten ASEAN countries in China noted that among all the ASEAN dialogue partners, the ASEAN's relations with China stand out as the strongest relations. The ASEAN appreciates the Chinese side for firmly supporting the ASEAN's central position in regional cooperation, and stands ready to deepen practical cooperation with the Chinese side in such fields as politics, economy, trade as well as people-to-people and cultural engagement. The two sides should work together to uphold multilateralism and safeguard the free trade system with the WTO at the core. Wang Yi and diplomatic envoys of the ASEAN countries in China also exchanged views on the South China Sea issue. The two sides agreed that with the joint efforts of China and the ASEAN countries, the situation in the South China Sea has been stabilizing. The agreement on the single draft negotiating text of the Code of Conduct in the South China Sea is of great significance. The ASEAN countries are willing to make joint efforts with the Chinese side to promote the negotiation for continued progress.